Education Sec. 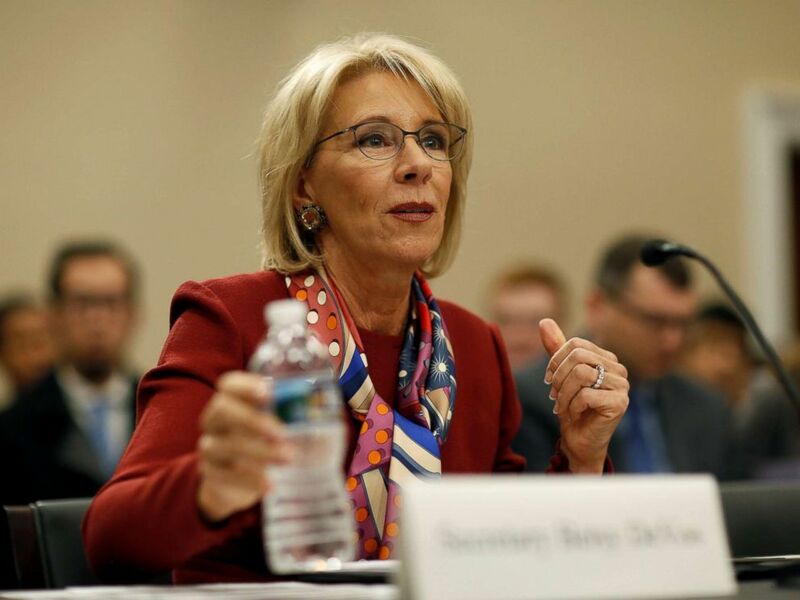 Betsy DeVos is re-examining Obama-era guidance intended to prevent "discriminatory discipline" against minority students, the Department of Education has confirmed. In a pair of "listening sessions" this week, the secretary met with two groups, one that supported the previous administration's recommendations, and one that had "concerns." The guidance, issued in 2014 in the form of a "Dear Colleague" letter, urges schools to develop policies based on "specific and objective criteria" and to emphasize positive interventions, like counseling, over more punitive measures, like suspension or expulsion. U.S. Secretary of Education Betsy DeVos testifies to the House Appropriations Labor, Health and Human Services, Education, and Related Agencies Subcommittee in Washington, March 20, 2018. But according to the School Superintendent's Association — invited to join the group opposing the guidance because of its concerns about what it says the government's "burdensome" investigatory process — DeVos and her staff may be overestimating the document's practical impact, positive or negative. "If the Department was hoping to have school leaders come out vigorously against the guidance, that wasn't what they achieved," advocacy director Sasha Pudelski told ABC News. "Based on what we know, our school leaders are not taking their cue from Washington," she continued. According to the association's latest data, "only 16 percent of members indicated they have changed their policies in light of the guidance." These "Dear Colleague" letters don't create new law, they simply clarify existing law — in this case, titles IV and VI of the Civil Rights Act of 1964 — and outline best practices for following it. So while rescinding the guidance wouldn't have much legal significance — it could "signal to everyone that the federal government doesn't care about black and brown children," according to Vanita Gupta, who led the DOJ's civil rights division under President Obama and now serves as president and CEO of The Leadership Conference on Civil and Human Rights. Like Gupta, most proponents of the guidance point to government data that suggests "discriminatory discipline" remains a real problem. The typical African American student is three times more likely to be expelled or suspended than their white peers, a statistic "not explained by more frequent or more serious misbehavior by students of color," according to the letter. "Many American schools still have a pretty distinct problem: separate and unequal discipline practices," Gupta told ABC. "We're not sure what is prompting this, outside of a desire to repeal everything from the prior administration." Experts worry that the disparate treatment sets up a "school-to-prison pipeline," diverting kids out of the educational system and into the criminal justice system. Many say the 2014 guidance, championed by Attorney General Eric Holder, send a message that disrupting the pipeline that hurts kids of color is a government priority. Critics, however, contend that teachers and staff are so afraid of triggering a federal investigation that they aren't disciplining enough. They argue that teachers, the very people who know students best, are being denied the discretion to punish kids who might pose a danger to themselves or others. Pudelski acknowledged that a small portion of Superintendent's Association members "said they felt pressure to keep students in school who school staff would have preferred to remove due to pressure from the office of civil rights." Wednesday's discussions took place behind closed doors, to protect attendees' privacy and protect them from potential retaliation, the department said. One attendee on Tuesday told the Washington Times she planned to inform DeVos of bullying her children had suffered at the hands of students she felt school administrators weren't able to control. In the meantime, 153 civil rights groups, from the ACLU to the National Bar Association, have signed a missive urging DeVos to let the "Dear Colleague" letter stand. "Rescinding the guidance would send exactly the wrong message. Every child deserves and should be included in a warm, welcoming and responsive school," the letter says. "These regulations and guidance documents and continued enforcement of the law are critical to making students’ rights real." According to Education Department officials, DeVos hasn't made a decision about how to proceed.